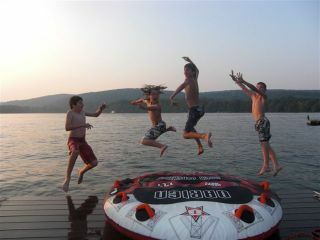 We had sooo much FUN at our friend&#39;s boathouse last week. Lake Waramaug is the second largest natural lake in CT and is the one area I know of which has been unaffected by the real estate market slump. Its just too nice, and the low supply/high demand equation has lead to continuing strong prices on the lake. It was one of those great late Summer hazy and hot evenings that was perfect boat weather. 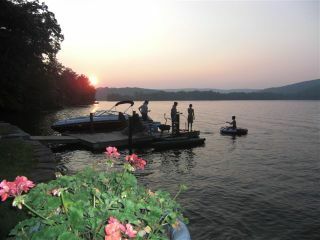 The kids went tubing, and knee boarding and surfing (who new you could surf off the back of a boat too?) Then they spent a good hour and a half doing jumping stunts off the dock (see above).